Did the Nats call up the wrong OF? As the rest of the free world now knows, Bryce Harper has gotten called up to give the incredibly weakened Nats lineup some potential offense. Sometimes moves can be planned and orchestrated (such as keeping Stephen Strasburg in the minors in 2010 past the super-2 deadline), and sometimes your hand is called. 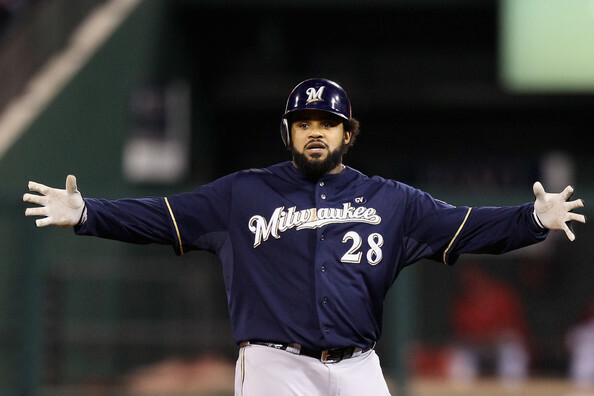 With Michael Morse out indefinitely, and with the most fragile $100m player this side of Carl Crawford (aka, F.O.T.F. Ryan Zimmerman) heading to the DL yet again, this team suddenly is without 55-60 homers and 200 RBIs in the middle of its order. So, we’ll roll the dice with the 19-yr old Harper. But, should the team really have called up a much more mature, much more MLB-ready member of the Syracuse Chiefs? A guy who is currently putting up this line in AAA: .278/.354/.556 with 6 homers in 20 games? A guy who has hit 30+ homers in two successive seasons, at two successive levels of the minors and is currently on a pace for more than 40 in AAA? Yes I’m talking about Tyler Moore, a 16th round draft pick who has come out of nowhere to become (arguably) this team’s 3rd best hitting prospect in the minors today. Yes, I know he’s a 1B primarily, and he’s just started taking reps in LF. But after watching Xavier Nady lumber towards balls in LF and watching Mark DeRosa turn routine RF fly balls into adventures, how much worse could it be to stick him out there instead and juggle Harper with Werth and Ankiel in CF and RF (matchup dependent)? Scouts and pundits have routinely discounted Moore’s abilities, and Mike Rizzo‘s scouting trip last week apparently made his mind up for him, so perhaps there’s a method to his madness. Maybe Moore really isn’t an OF option despite his LF experiments. We’re not watching him game in and game out, just typing out blog posts from our dining room table. Either way, the Nats should get at least a more competent batter in the line-up. If Harper comes up and starts blasting the ball all the better. Another edition of mlb.com beat reporter Bill Ladson’s inbox, dated 2/14/12. As always, I write my response before reading his, and sometimes edit questions for clarity. 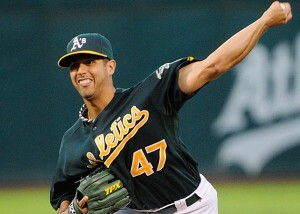 Q: I loved what I saw from relievers Henry Rodriguez and Craig Stammen last year. What do you think 2012 has in store for them? A: I loved what I saw from Henry Rodriguez too … as long as it wasn’t July. Check out his splits from 2011: he posted an 8.10 in July but was excellent otherwise. Also noteworthy is how much he managed to put things together in September; he had 14/4 Ks/BBs in his 12 1/3 September innings (and only one wild pitch! ), by far his best bb/9 rate of any month. Whatever the coaching staff was finally able to get him to do, assuming it took all season to get there, paid off. The question for 2012 is this; can he be the guy he was in September, is he gonna be the guy we saw most of the rest of the season, or is he gonna be Mr. July? Craig Stammen may have had stellar late-season numbers in 2011, but look at his game log. He had 5 appearances in September; Houston (worst team in the league), NY Mets (which by September was fielding a AAA lineup), Florida twice (your last place team in the division), and a reeling Philadelphia squad (which finished the season a pedestrian 16-14). I like Stammen but think that his role is pre-ordained for this team in 2012; he’ll be a starter in Syracuse, biding his time and serving as insurance for a starting pitching meltdown in Washington. He may get another September call-up but he seems set to reach minor league free agency in next off-season. Ladson says he thinks Rodriguez will have a break-out season based on September. Fair enough guess. He thinks Stammen may make the team as a long-reliever?! Not sure how; have you see the options status of the bullpen lately? Click on the Big Board and look at the Options tab; Tyler Clippard, Sean Burnett, Henry Rodriguez, Tom Gorzelanny and Ross Detwiler ALL are out of options. Brad Lidge can refuse a demotion based on his service time and Drew Storen is your closer. There’s your 2012 bullpen; not much room for anyone else. 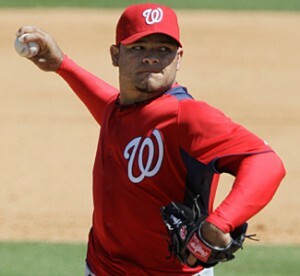 Q: Who do you think will be the Nationals’ Opening Day starters in right and center field? 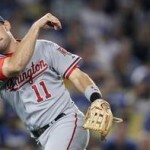 Do you think Bryce Harper gets the nod with Jayson Werth in center? 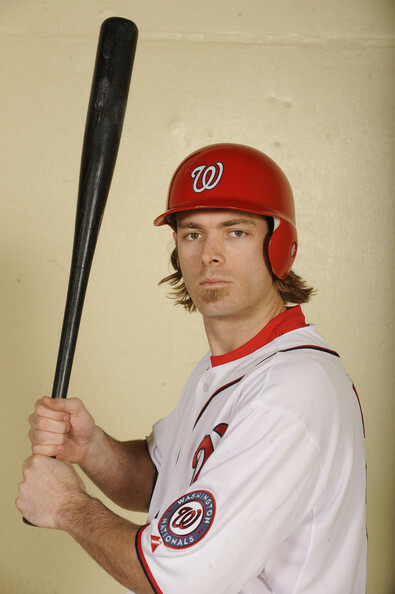 A: Gun to the head i’m going with Jayson Werth in RF and Rick Ankiel in CF. Bryce Harper is not going to make the opening day roster. I wish this story would go away. Lets bottom line it; 2 months of Harper as a 19-yr old at the expense of possibly 15-18M in extra payroll due to the kid by starting his arbitration clock early PLUS possibly losing his age-25 year to free agency is NOT going to be an adequate trade-off. Davey Johnson may want Harper on his opening day lineup, but Johnson isn’t responsible for administering the long-term plan for this franchise. Ladson doesn’t even address the arbitration clock issue and says he thinks Werth-Harper is best combination. Great reporting. 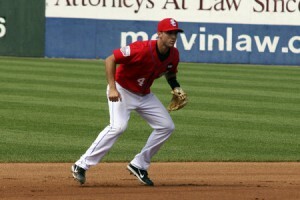 Q: Assuming Harper starts in the Minor Leagues, why not have Mark DeRosa as an option in right field? The team can still put Werth in center. When healthy, DeRosa is a proven hitter who could provide more offense than any platoon of players could. A: Hmm. Just looked up Mark DeRosa‘s uzr/150 in the outfield over his career and it isn’t half bad; he didn’t play any OF for San Francisco in 2011 but has decent numbers historically in either corner outfield position. Problem is, he’s a righty. If you put Werth in CF and DeRosa in right, then you’re fielding a lineup of 6 righties and 2 lefties. Not good unless you’re going up against a lefty starter. Which, of course, the NL East has plenty of. So yeah that may be a line-up option. Ladson agrees. 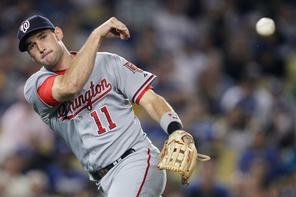 Q: What is Danny Espinosa doing to correct the drop-off that we saw during the second half of the 2011 season? A: A good question; lets hope that its “first full season-itis” that led to natural league adjustments and player fatigue of playing 162 games when theretofore he had only ever played around 140 in a full minor league season (to say nothing of the 50-some odd games that collegiate players play, with mostly mid-week games against weak opponents). Espinosa has been working hard this off-season and it would be nice to see his lefty/righty splits improve over last year (.223 batting lefty but .283 batting righty). Ladson also predicts a break out season for Espinosa. Is there anyone he does NOT think will have a breakout 2012? 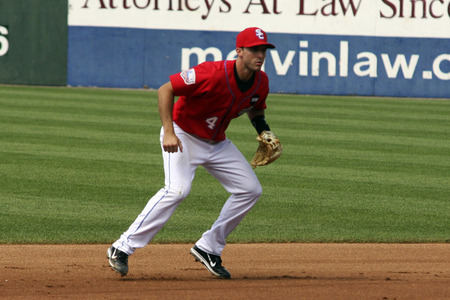 Q: Does Stephen Lombardozzi have a legitimate shot at taking a starting spot from Ian Desmond in Spring Training? Desmond has been inconsistent and doesn’t get on base enough for someone with little power. A: Hard to see that. Yes Desmond is inconsistent at the plate but he’s also pretty good in the field. Lombardozzi needs to get some more exposure to MLB pitching to see if his minor league numbers are legit or a mirage. Ladson says Lombardozzi gets a shot if either middle infielder really struggles in April. Q: With the addition of Edwin Jackson, where does Ross Detwiler fit with the Nationals? A: I think its pretty clear that Detwiler is now 7th on the starting pitcher totem pole. Perhaps even 8th behind Gorzelanny, who has had several seasons of starting versus Detwiler’s handful of sporadic starts over the past few seasons. Based on option status, Detwiler is in the bullpen as long-man/spot starter, barring injury. I don’t think the team is really featuring a competition for starting pitching; if it comes down to it I see either Wang or Lannan getting traded or “injured” heading to April 1st. Ladson agrees.